Knolls Atomic Power Laboratory Inc. The capital of the “Empire State,” Albany sits in the demographic heart of New York State. As the state capital, it has a distinctly political atmosphere but it also boasts a vibrant and diverse economic climate with a significant reliance on education and health care as well as government. 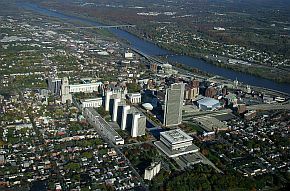 In the last decade, Albany has also seen rapid growth in the technology sector as its central location in the newly named “Tech Valley” section of New York attests. High tech companies such as the chipmaker, Global Foundries and institutions like the College of Nanoscale Science and Engineering further burnish this image. The new millennium has been exceptionally good to the economy of this city on the west side of the Hudson. It has a significantly lower than average unemployment rate, its population is steadily growing and it has not been hit particularly hard by the housing crisis. The affordability and the diversity of Albany add up to a great opportunity for both businesses and employees.